Not to be confused with Nien Nunb. Ten Numb is a minifigure first released in 2006. Ten Numb's second variant has red legs printed with some straps, an air hose, and a belt. His red torso is printed with a vest containing a control panel, and the connection to his air hose. His tan head is printed on both sides. One side has his breathing mask, while the other shows his uncovered mouth. 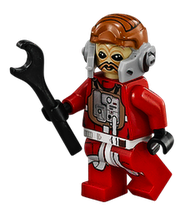 He comes with two accessories- a black spanner and a grey helmet with dark red, black and dark orange printing representing the headgear of a Rebel pilot. Ten Numb was a Sullustan starfigher pilot for the Rebel Alliance. During the Battle of Endor, Numb piloted a B-wing under the callsign of Blue Five. Another view of the 2014 version of Ten Numb.